So it has been just over a year, since my first blog post. Even though the whole work / life thing has kept me overly busy the last couple months, reducing me to 1-2 posts a month, it has been quite a pleasing experience blogging. I would recommend it to all developer types, it's an good way to keep you investigating, learning and having your work out there and visible to people makes you put in that little extra effort. The actual reason for this post is for some discussion on the stats... There were 1 or 2 interesting percentages I would not have expected. 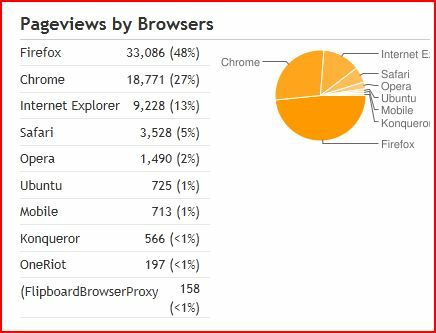 With this being an Java-technical-open source oriented blog makes FireFox the obvious choice to lead the browser war. 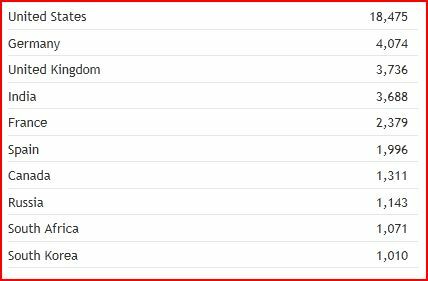 However with Chrome in 2nd by a such large percentage was a bit unexpected. 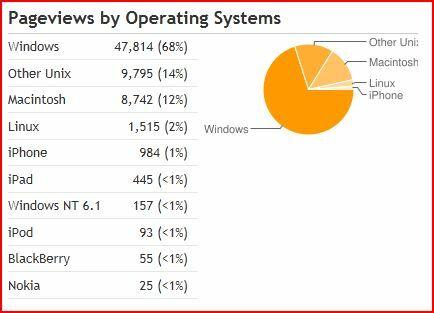 On OS Windows is still number one. Apple is competing nicely with Linux / Unix combined, this is probably due the large apple following in the US and the boom of the iPad. I am glad that I found your blog. The simple Big-O Notation Post. Design Patterns in the JDK.